bake on hot stones around a fire. Based on the evidence of charred bread crumbs found in the Jordanian desert recently, archaeologists reckon that this is the recipe for the earliest loaves of bread made on earth. Fourteen thousand years ago, long before they had become crop-growing farmers living in reasonably settled communities, our ancestors were already investing huge amounts of time and effort into bread making: grinding, mixing, and then baking on hot stones loaves that would have looked very similar to pitta bread and, apparently, tasted something like the multigrain loaves you can buy in an artisan bakery today. Archaeologists have surmised that such effort indicates the special role that bread played on special occasions deep in pre-history. All this makes the first mention of bread in scripture, when King Melchizedek blessed bread and wine in honour of Abraham in the book of Genesis, comparatively recent – about four thousand years ago. And that mention in Genesis is the first of many in scripture. To take just a few examples from the Old Testament: there is the unleavened bread that the Israelites were instructed to bake to save time on the night that they escaped from captivity in Egypt; the consecrated bread for use in the shrine that the future King David, on the run from a murderous King Saul, took from the priest at Nob in order to feed his men; the rather unusual bread which that very unusual prophet Ezekiel was instructed by God to make and eat in Babylonian exile made of wheat, barley, beans, lentils, millet and spelt. And of course there is the bread that Jesus’s fellow Jews refer to in today’s Gospel reading, just after they have witnessed the miracle we know as the Feeding of the Five Thousand: Our ancestors ate the manna in the wilderness; as it is written ‘he gave them bread from heaven to eat’. Bread: a tangible sign of God’s provision for humankind; bread: a staple that transcends culture but whose local manifestations – naan, pitta, baguette, focaccia – have acquired the status of cultural artefact. But for the Jewish people the manna in the wilderness, the bread from heaven, was more than a cultural artefact. It was central to their very identity as a nation under God, as indeed it is today. The exodus from Egypt and the subsequent years of wandering in the wilderness were not something confined to the past for Jesus’s contemporaries. They constituted an essential ingredient of their present experience as well. A nation forged in adversity remembered itself each year through the sharing of a meal at the Festival of Passover. This meal included eating matzo, the unleavened bread which symbolised freedom and redemption from slavery, and which reminded the Jewish people of how God had continued to provide for them in the wilderness years in the form of manna, bread from heaven. All this is part of the background to the discussion that Jesus has with the crowd in today’s Gospel reading. John has already told us earlier in chapter six that the Festival of Passover was near. The crowd has witnessed the miracle of the Feeding of the Five Thousand, but people don’t seem to have understood the importance of what they have witnessed: What sign are you going to give us then, so that we may see it and believe you? they ask. Haven’t they just seen a sign? Well of course they have. But instead of labouring that particular point, Jesus draws the crowd back to the foundational story that had shaped and continued to shape them: the Exodus and the years in the wilderness. Very truly, I tell you, Jesus says, it was not Moses who gave you the bread from heaven, but it is my Father who gives you the true bread from heaven. For the bread of God is that which comes down from heaven and gives life to the world. The abrupt change from past to present tense (it was not Moses; it is my father) makes the point that the God who provided in the wilderness is the God who continues to provide. True bread, true sustenance, can only come from the true God. The crowd readily understands and warms to this teaching of Jesus: Sir, give us this bread always. The sheer, astonishing, stupendous force of what comes next, the last verse in today’s Gospel reading, has been blunted for modern listeners through a curious mixture of familiarity with the words themselves and a lack of awareness of their significance: Jesus said to them, ‘I am the bread of life’. As they heard this claim the crowd would instantly have recalled the divine voice from the burning bush in the Book of Exodus. When Moses asked what he should say to the Israelites when they asked who had sent him, the voice said: Thus you shall say to the Israelites, ‘I am has sent me to you’. And here in front of them is Jesus saying I am the bread of life. The ‘I am’ who will eternally satisfy your hunger and your thirst. The ‘I am’ who will liberate you from the exile of sin and estrangement from God. The ‘I am’ who is one with God the Father. As we will hear next week, the crowd will turn on Jesus for this assertion of his divine status, unwilling or unable to receive the sign of the miraculous feeding or the words that follow it; unwilling or unable to receive the living bread that has come down from heaven. I leave you with this thought. I said earlier that matzo, the unleavened bread eaten at Passover, symbolised freedom and redemption from slavery for the Jewish people. 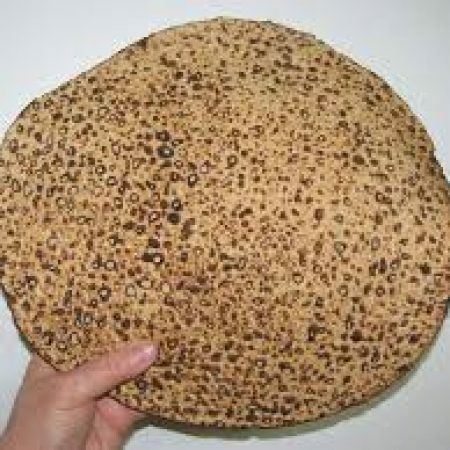 Matzo is also called in Hebrew lechem oni, poor man’s bread and in Aramaic lachma anya, the bread of affliction. Matzo is therefore a reminder, for those who eat it, of the absolute religious obligation for humility because, before God, rich and poor and those between are all of equal worth. And matzo is also a reminder of those whose lives are afflicted in ways we can only imagine: by poverty or violence, by exile or neglect. As we prepare to receive the living bread in the sacrament of Holy Communion may we do so not only with thankfulness for our own liberation into new life through the resurrection, but also with due humility and in deep prayerfulness for our brothers and sisters, our neighbours in God, who continue daily to eat the bread of affliction.